ADALBERO (ADALBERON von DILLINGEN), scion of the Counts of Dillingen (Duchy of Swabia), and uncle of St. Ulric (4th July). St. Adalbero received monastic tonsure in 850 at Dillingen. He served as tutor to the future King Louis the Child, and as Abbot of the Imperial Abbey of Ellwangen. St. Adalbero was consecrated Bishop of Augsburg circa 887 serving until his repose in 909. APHRODISIUS, CARALIPPUS, AGAPIUS, and EUSEBIUS, (Date Uncertain), early martyrs in Languedoc. Various traditions place them in the first, second, or third centuries Their lives were memorialised by St. Gregory of Tours (17th November). ARTEMIUS, a native of Sens who became Bishop of that See. He attended both the Second (581 or 582) and Third (585) Synods of Mâcon. St. Artemius was also the spiritual father of St. Bond (15th September). St. Artemius reposed in 609. CRONAN of ROSCREA, the founder of several monasteries in Ireland, the major one being at Roscrea, Co. Tipperary. St. Cronan was known for his wonderworking, and had many disciples. St. Cronan reposed circa 640; his relics were enshrined in the church at Roscrea. GERARD, (Probably Seventh Century), traditionally believed to have been one of four pilgrims from England — the other three were Ardwine, Bernard, and Hugh — who all reposed in Galinaro in the south of present-day Italy whilst on a pilgrimage to the Holy Land. There is some doubt amongst scholars as to the historical authenticity of their existence, and if they did indeed exist, the century in which they flourished. MARK of GALILEE, according to tradition, St. Mark was a native of Galilee who went to Italy where he was converted by St. Peter (29th June). The Apostle then dispatched him to the Abruzzi to enlighten the local population and serve as first Bishop of that See. St. Mark’s mission was quite fruitful, though he was martyred 92. PAMPHILUS, a seventh century Bishop of Sulmona and Corfinium in the Abruzzi. St. Pamphilus was renowned as a wonderworker, and his seemingly endless charity and love for the poor. POLLIO, a reader of the church of Cybalae in Pannonia. 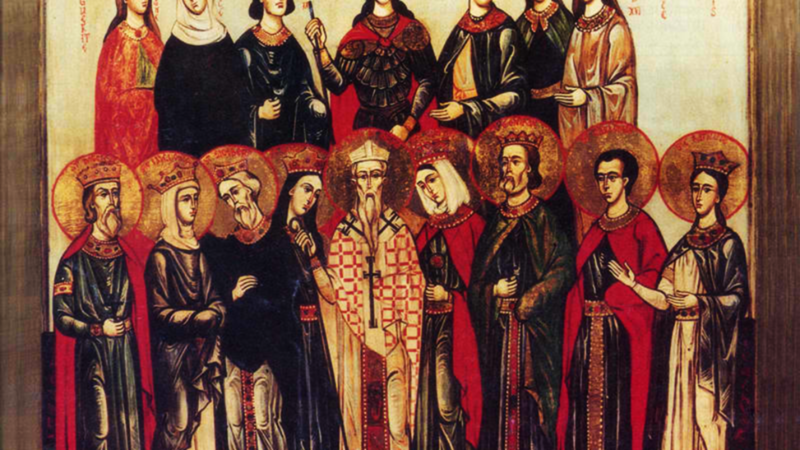 St. Pollio, along with a group of fellow Christians, was martyred, circa 304, during the Diocletianic Persecution. PRUDENTIUS, St. Prudentius became a hermit at the age of fifteen, and seven years later began evangelising the area around Calahorra Aragon. A wonderworker of some renown, he was soon ordained to the priesthood. After serving as Canon in the church at Calahorra, St. Prudentius was consecrated Bishop of Tarazona, Aragon, reposing circa 700. URSICINUS of RAVENNA, a physician sentenced to death for being a Christian. As the time of his martyrdom came closer, St. Ursicinus’ began to weaken and thoughts of apostasy entered his mind. However, with the support and encouragement of St. Vitalis of Milan (vide infra), St. Ursicinus remained resolute and was beheaded for his faith, circa 67. VALERIA, (First or Second Century), wife of St. Vitalis of Milan (vide infra), and mother of SS. Gervase and Protase (19th June). St. Valeria was martyred along with her husband St. Vitalis (vide infra). VITALIS of MILAN, (First or Second Century), husband of St. Valeria (vide supra), and father of SS. Gervase and Protase (19th June). St. Vitalis is believed to have given moral and emotional support to St. Ursicinus of Ravenna (vide supra) whilst facing martyrdom.